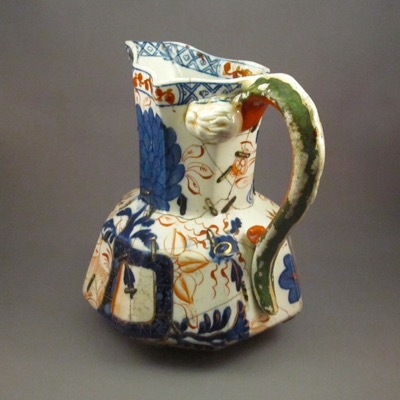 This octagonal shaped jug with a snake form handle was made in Staffordshire, England, in the early 1800s. 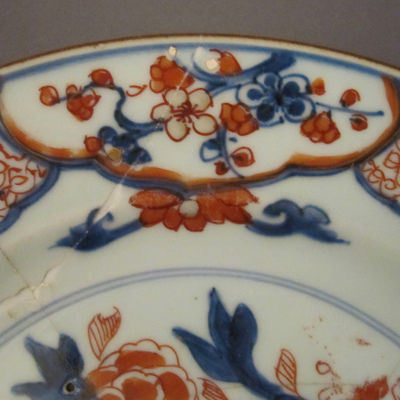 It is decorated with a cobalt blue geometric border, chrysanthemums, and leaves, with red and green overpainting and gilt highlights. 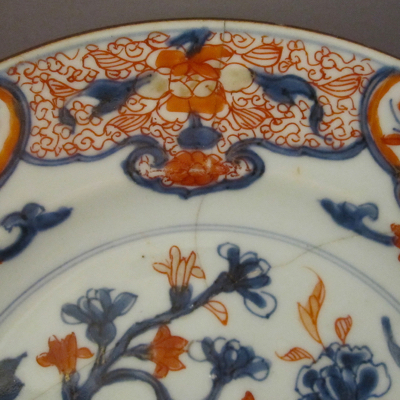 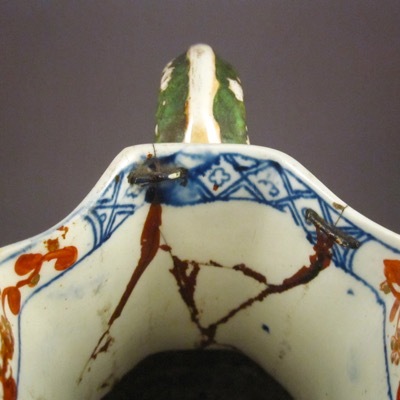 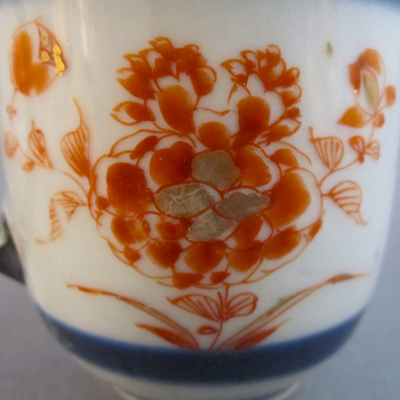 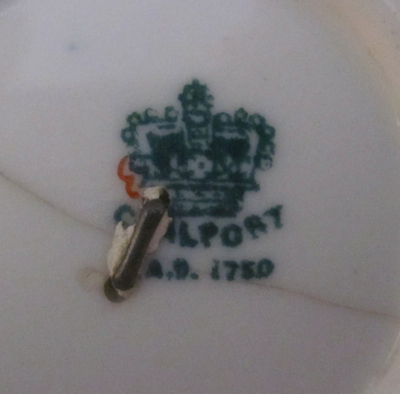 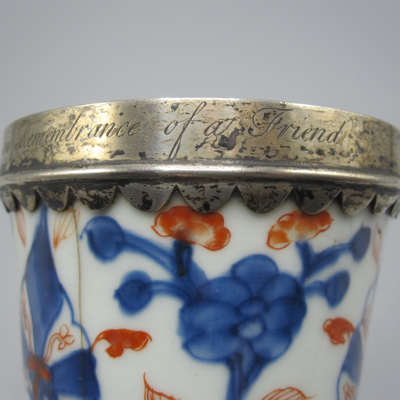 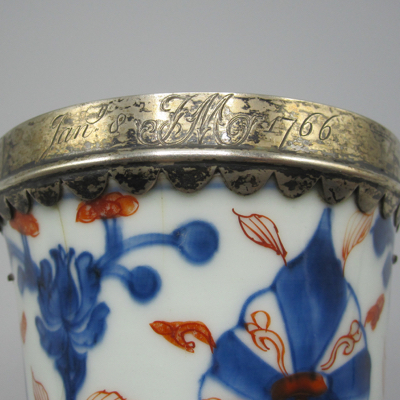 On the underside is the stamp “DAVENPORT STONE CHINA,” which dates this jug to 1805-1820. 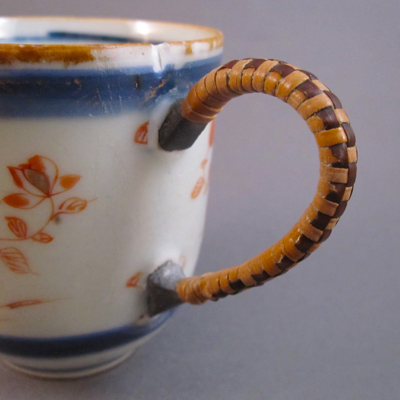 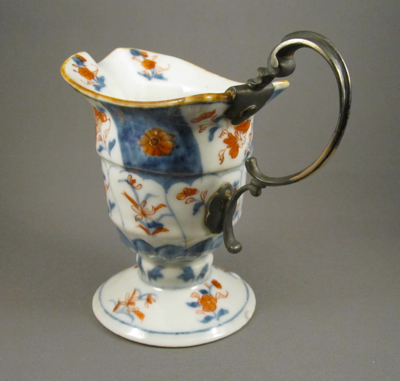 It stands 7 inches high and is 6.5 inches wide from lip to handle. 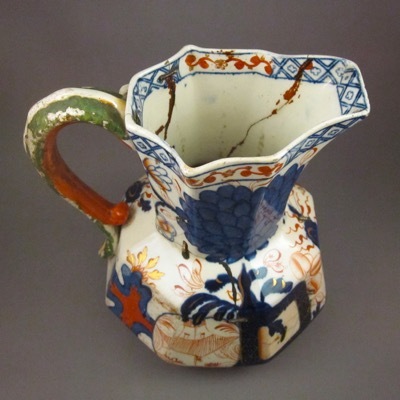 It appears that well over 100 years ago this jug had a great fall, but unlike Humpty Dumpty, it WAS put back together again. 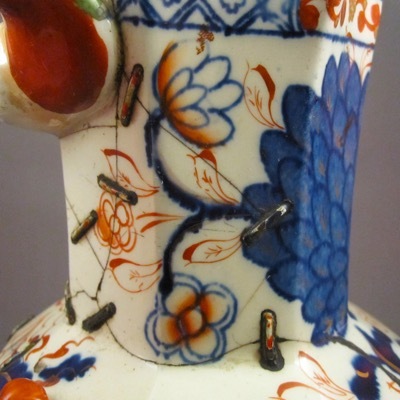 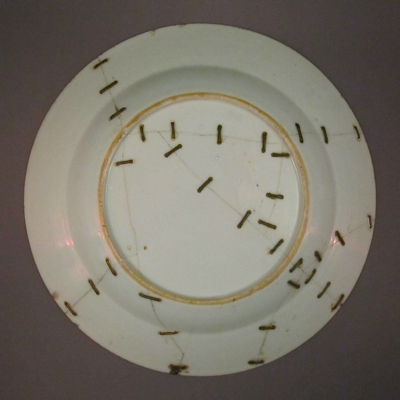 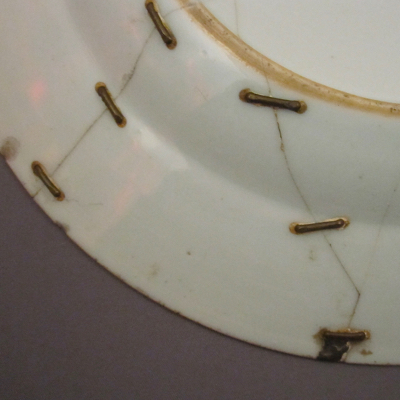 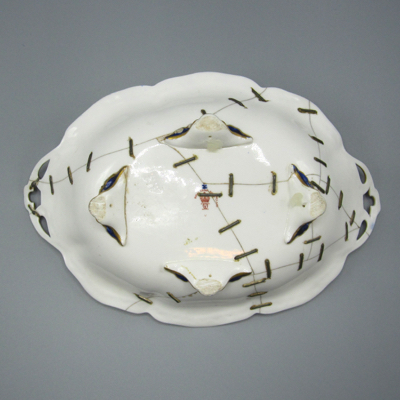 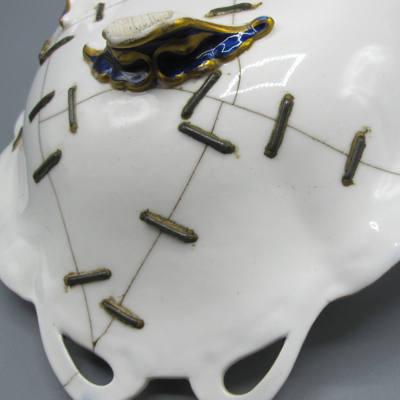 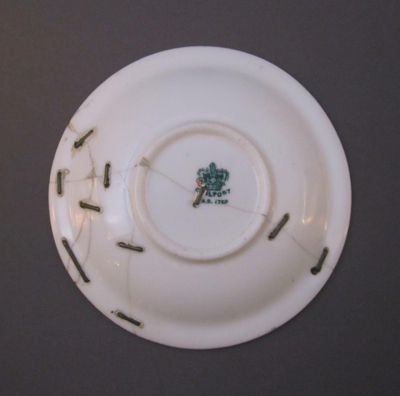 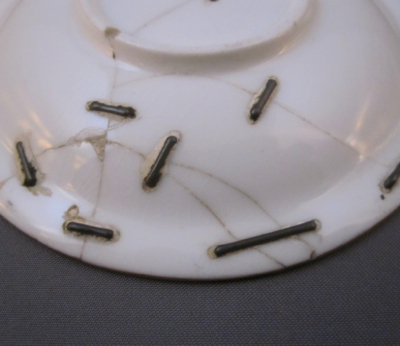 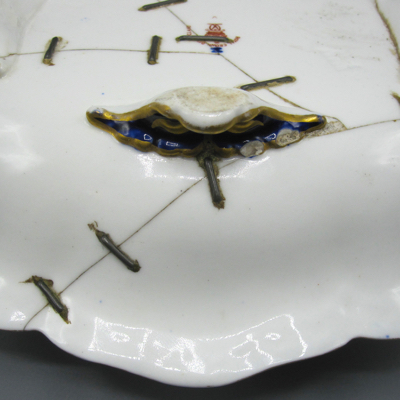 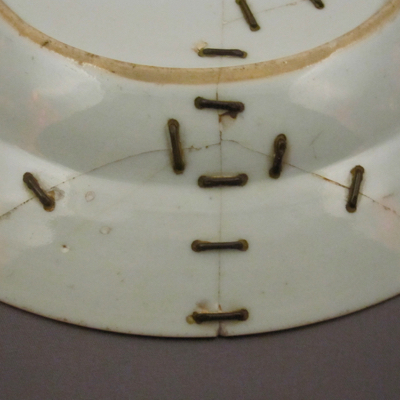 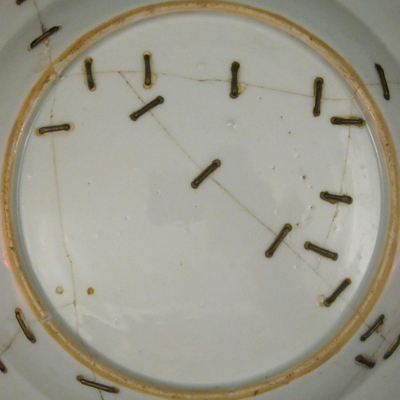 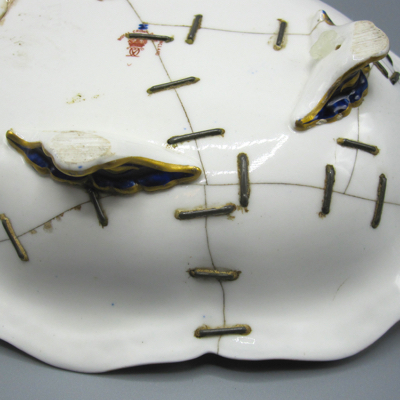 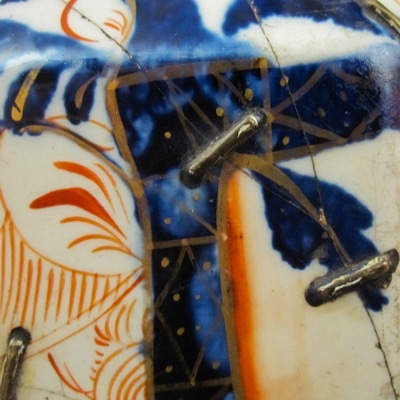 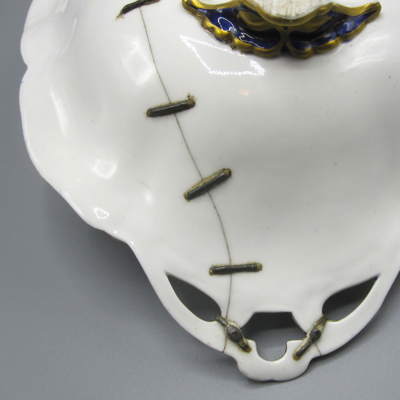 A “china mender” used 27 metal staples to secure the cracks, adding an unintentional secondary pattern to the already busy design. 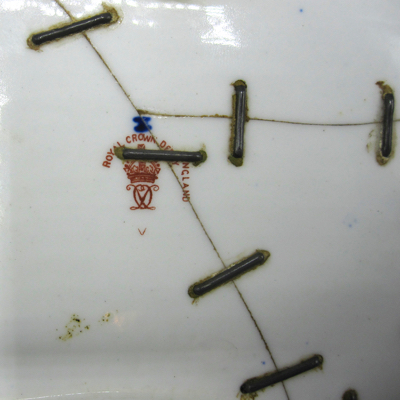 For extra precaution, red wax was applied to the cracks on the inside, as a deterrent against possible leakage. 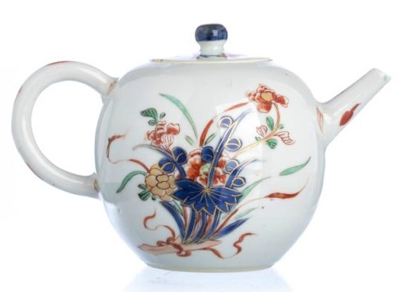 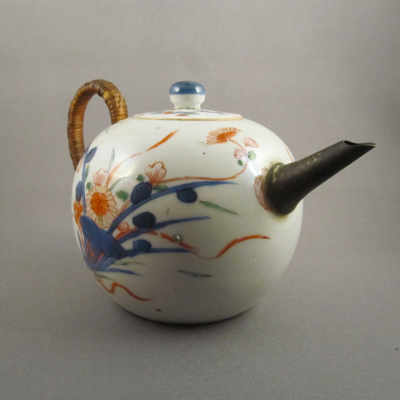 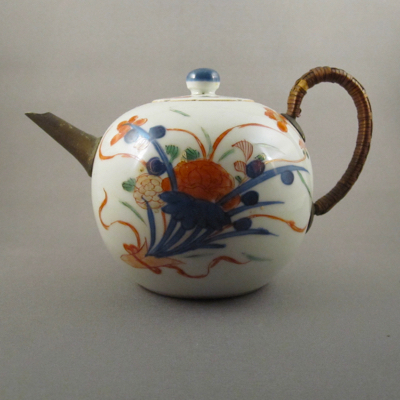 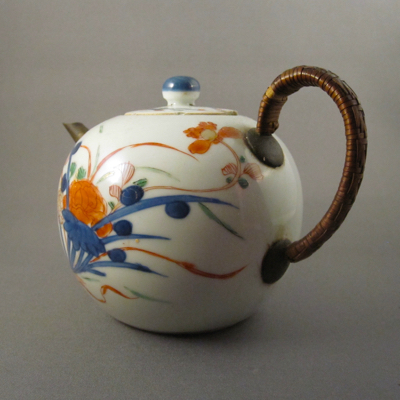 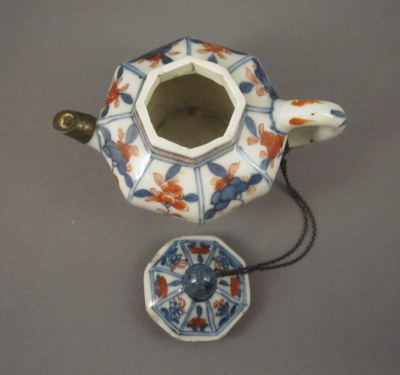 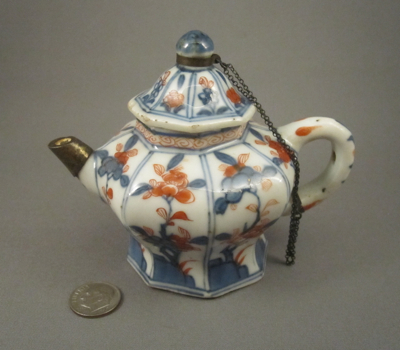 Though this octagonal-shaped Chinese porcelain teapot from the Kangxi period (1662-1722) appears to be a miniature, it is indeed a functioning vessel. 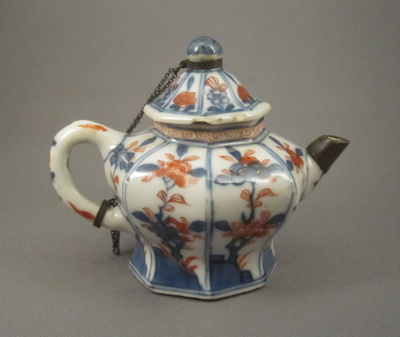 Tea was only for the wealthy in the late 17th century; brewed in highly concentrated batches in tiny teapots and consumed in small amounts. 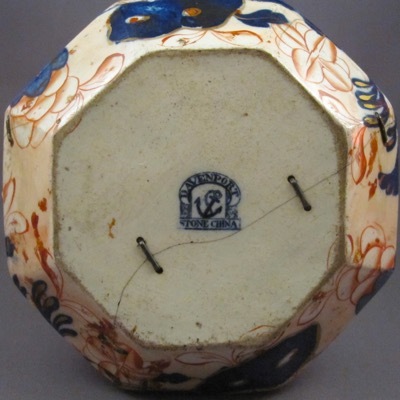 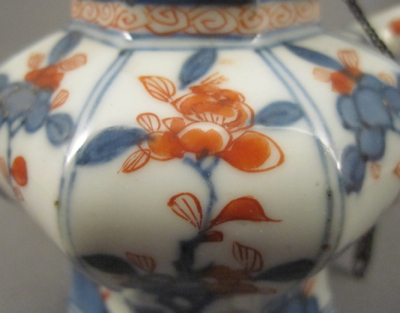 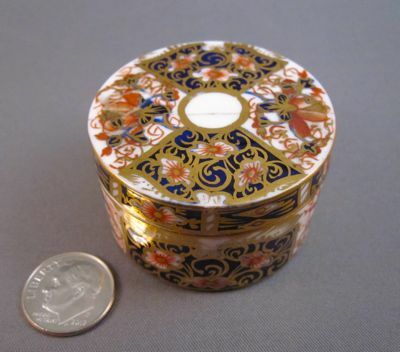 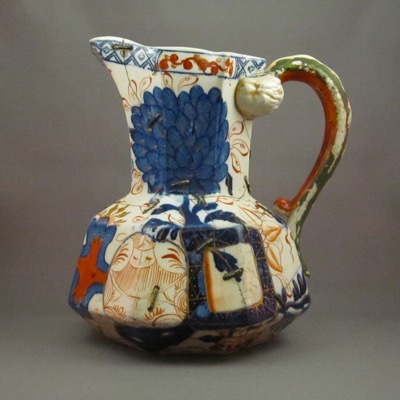 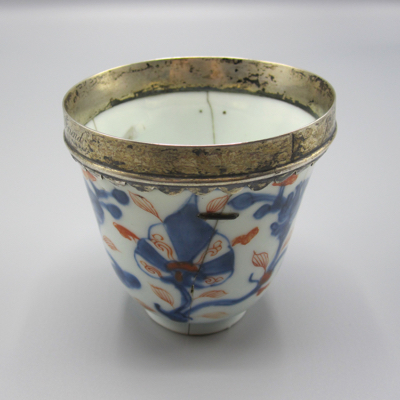 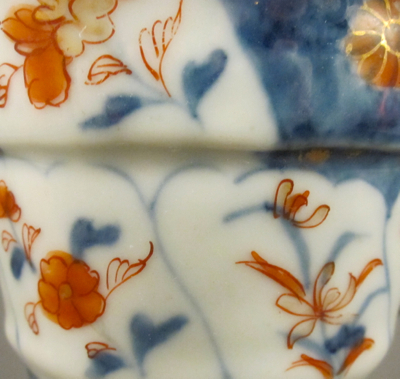 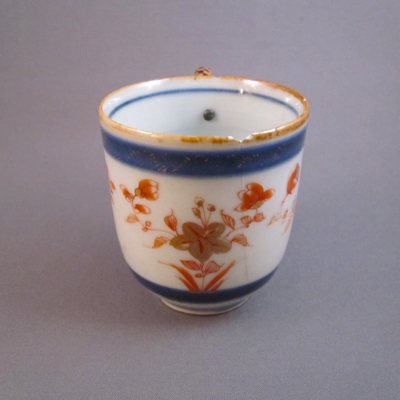 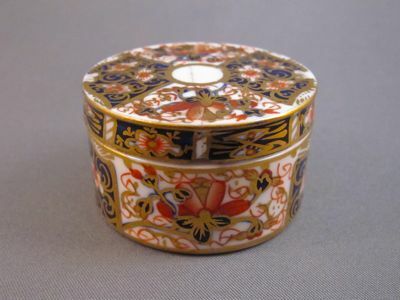 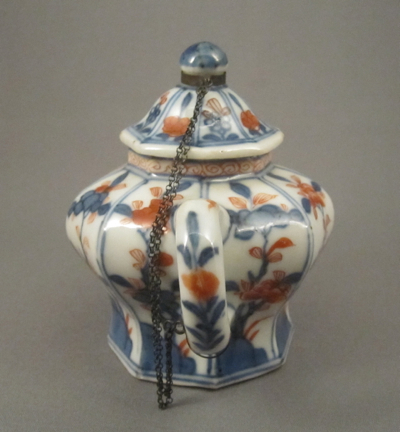 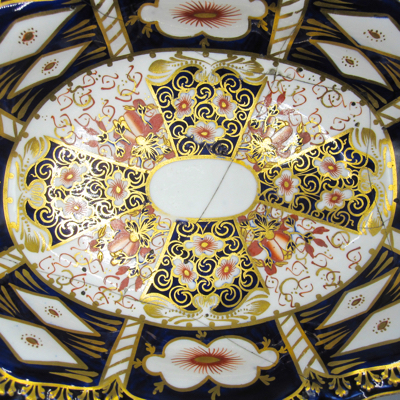 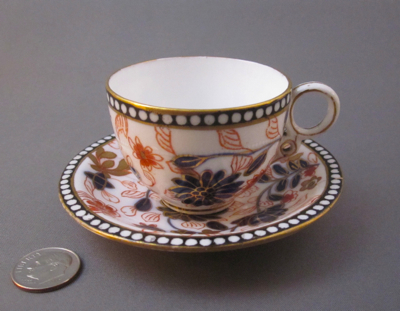 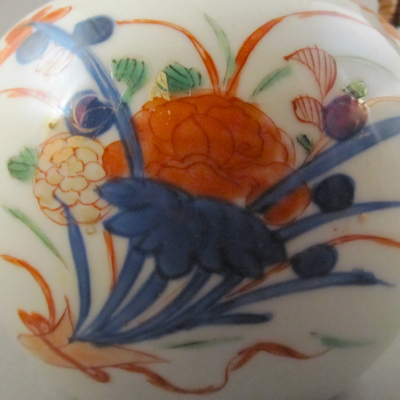 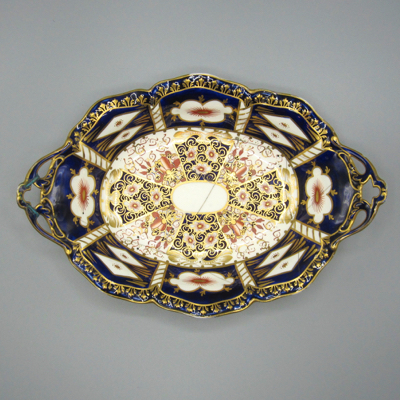 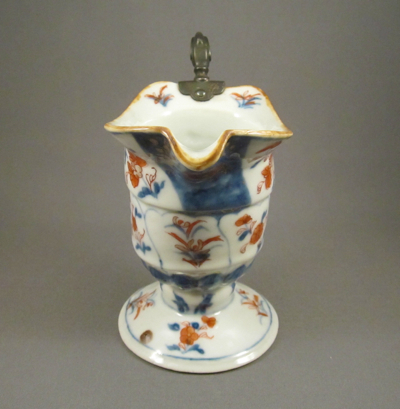 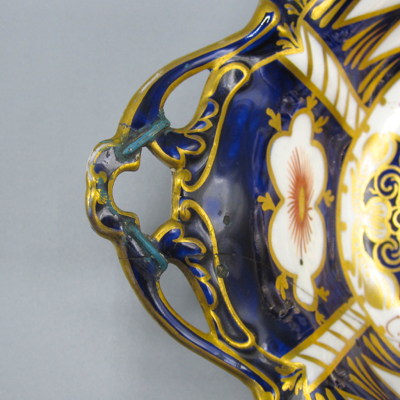 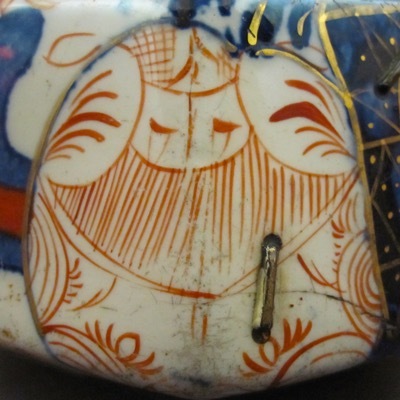 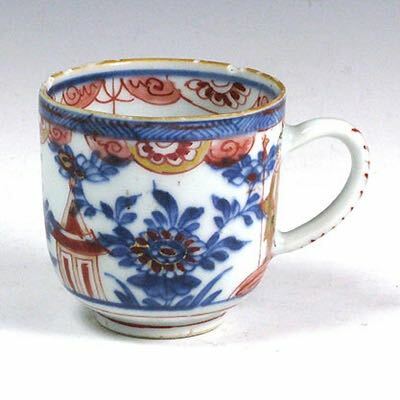 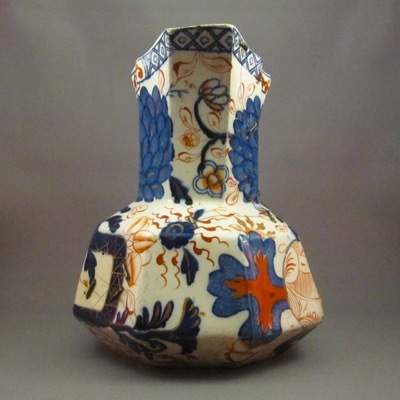 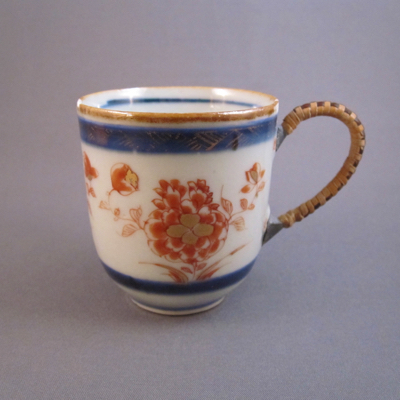 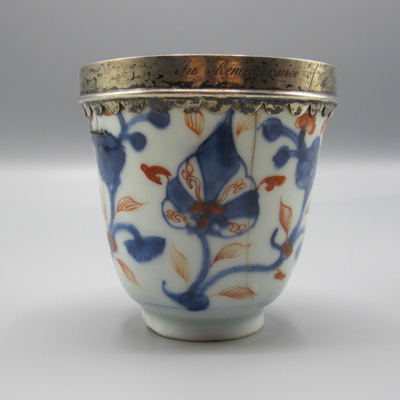 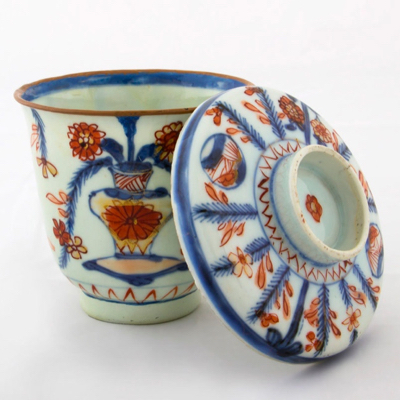 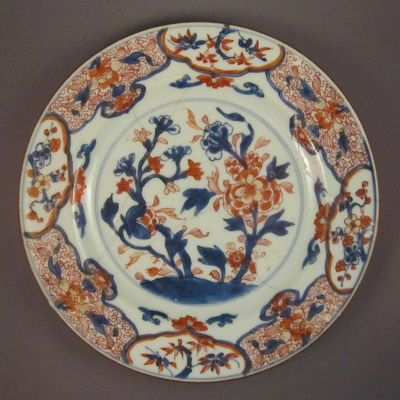 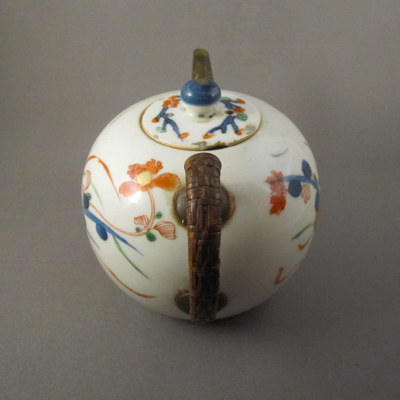 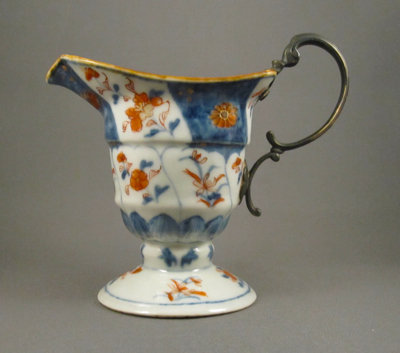 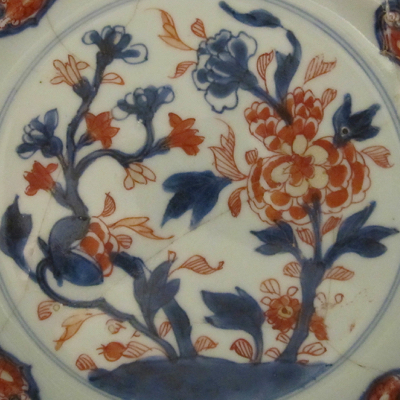 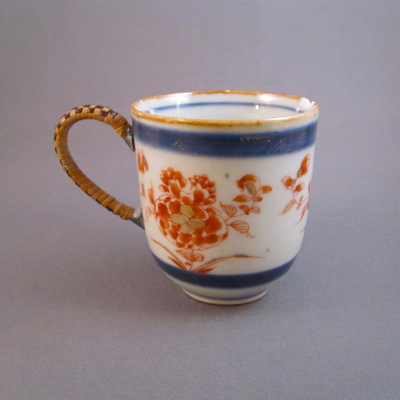 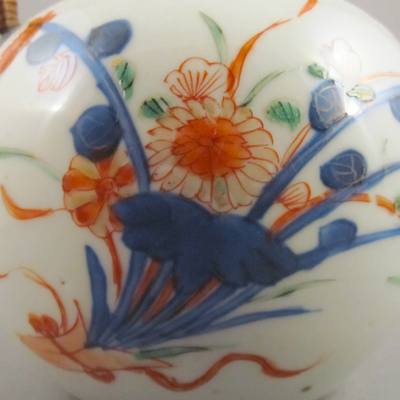 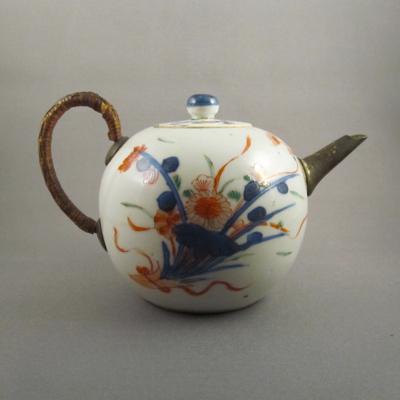 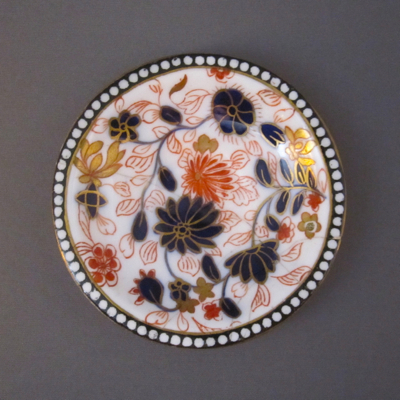 This fine example, which stands nearly 4″ high, has cobalt blue underglaze decoration with iron red and gilt detailing. 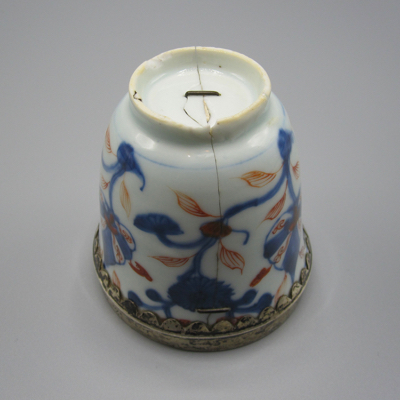 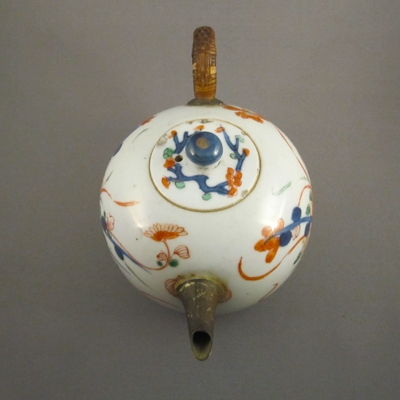 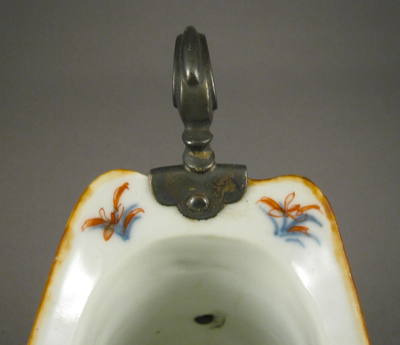 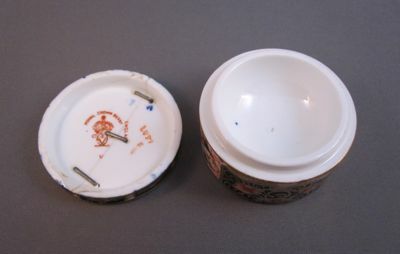 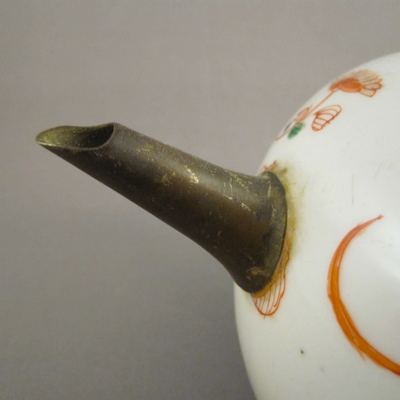 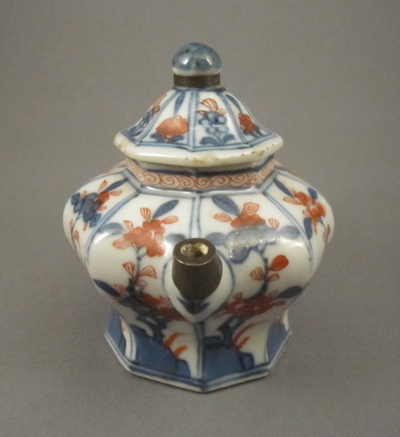 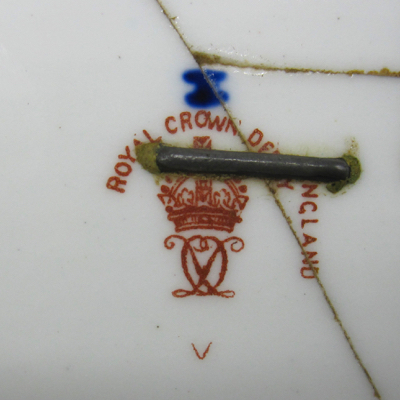 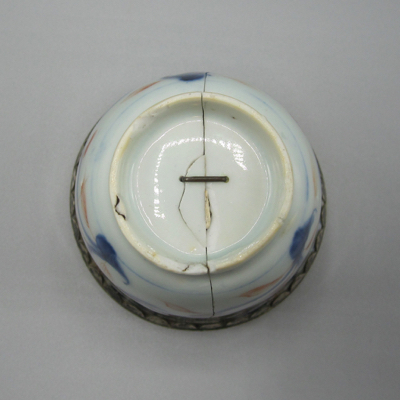 The remains of the original porcelain spout have been replaced by a much smaller silver cap, most likely in Amsterdam in the 1800s. 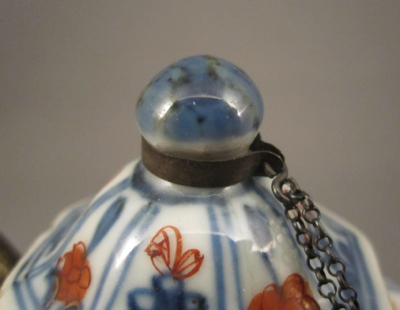 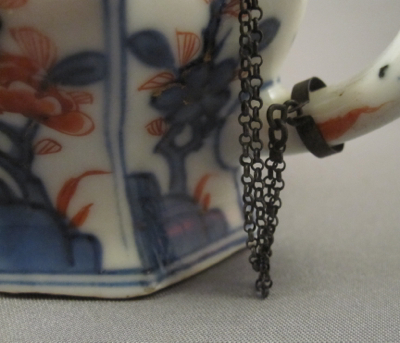 As a precaution against loss, the lid has been shackled to the handle using a fine-link chain. 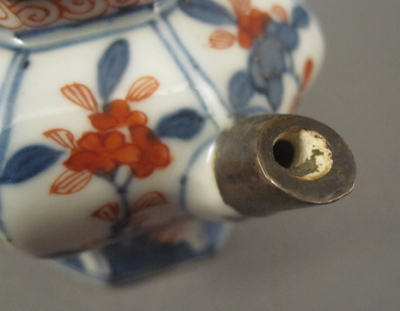 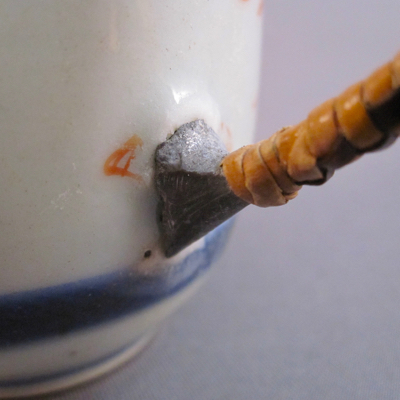 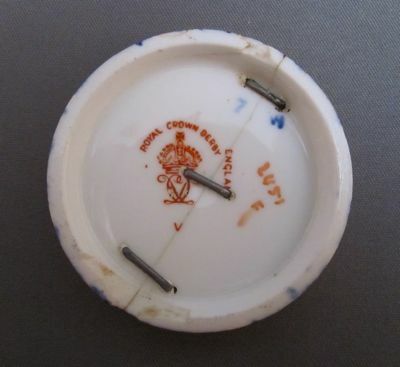 This embellishment may have been added at the same time as the replacement spout. 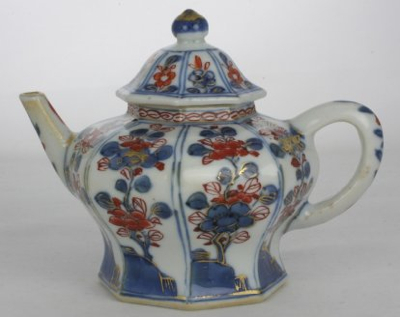 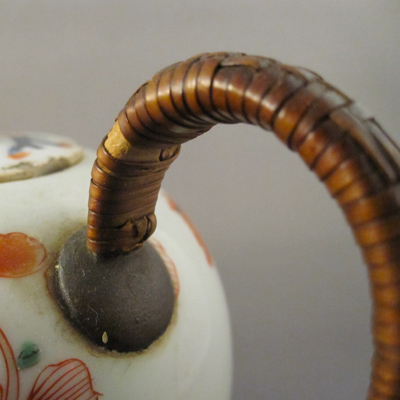 This nearly identical teapot with the same form, size and decoration as mine shows what the original spout looked like before the addition of the silver replacement.